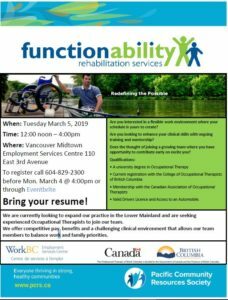 Comments Off on Join us March 5th in Vacouver for our Job Fair! Information: Are you interested in a flexible work environment where your schedule is yours to create? Are you looking to enhance your clinical skills with ongoing training and mentorship? Does the thought of joining a growing team where you have opportunity to contribute early on excite you? Working for FunctionAbility may be right for you. We are currently looking to expand our practice in the Lower Mainland and are seeking experienced Occupational Therapists to join our team. Valid Drivers Licence and Access to an Automobile.